A different way of approaching the baby’s birth. Useful techniques but also a different way of thinking about how birth begins and making a birth easy. These are a mixture of my notes of the presentation pulling points from the power point slides. I have labelled my comments clearly and where I have lifted slides the extra speaker comments are in italics from my notes. Italics can also denote my interpretation of what was said. Personal story –She was present at the birth of her sister in 1965, and 3 years later with her younger sister she ‘giggled’ through the birth of her brother. Diane is a GP by profession and has 4 children. Three were born at home, one against medical advice. Comment: in her talk this experience and understanding clearly influenced her work as a clinician in this area and she was open about the fact that it had. She said that she convinced her peers with medical evidence, but her personal experience was what kept this as a priority and kept her pushing with her CCG colleagues. It also helped that her Commissioner colleague for maternity services at the CCG was a GP who, along with her siblings, had been born at home. They both felt that peer to peer discussion was what worked in pulling this off. It was clear from Diane’s presentation, her colleague the commissioner in the audience and the senior Clinician speaker earlier in the day that there had been a number of them convinced of the need, and wanting to set up, a homebirth service in Birmingham, however, the barriers had been too great until now. Interaction of evidence with clinical commissioning – lack of pathway from evidence to implementation. Need for leadership. Increasing population, young city, high birth rates- links to capacity – easier to do more of the same? Under-used home birth service because not dedicated – on call midwives pulled into labour ward leading to patients not satisfied (promised service not happening). Not promoted as a result. What were the GPs concerns about the service? Comment: Key concern seemed to be that they would be landed with situations beyond their competency: they would be called out to a birth or be involved in night transfers. Thought they would have to do the baby checks – but midwives can do it. Worried be responsible if things went wrong when they had no control over it. 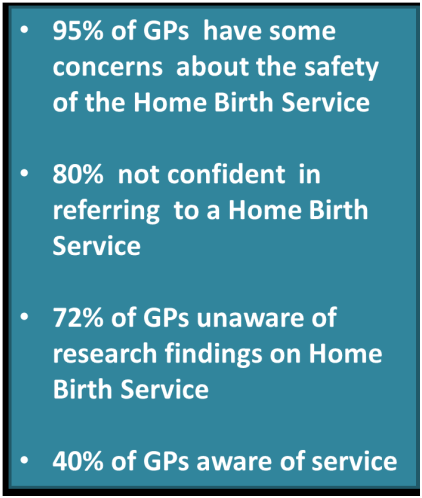 Clear that most GPs had little expertise in this area and were unaware of latest research on homebirth and other research findings. A cross section of convinced and committed professionals pushing for it over a long period of time. Doctors, midwives, women. Peer to peer advocacy important. Building sustainability in terms of finance and numbers is important right from the start – the service had to work on the Maternity tarrif alone – this has been a problem with past projects. Evidence, data, choice and capacity issues creating a mandate – ie the combination of the medical evidence, the choice agenda in public health policy and the hospital capacity issue – too many babies being born for the Obstetric Unit to cope with. Enthusiastic provider team (MWs and OBs), enthusiastic (female) GP commissioners- with a desire to improve choice and reduce interventions for low risk women. Non recurrent spending requirements- initial pump priming . To get the results and the savings long term initial investment has to be made. Work to promote it to GPs- educational events, GP networks Peer to peer education seemed to be key. I would add strong leadership from CCG Commissioners – who were female, mothers and had personal experience of homebirth. It is a strategic thing. Continuity of care is important: 3 or fewer midwives through whole package of care. Another presentation by the head of the HB team said that they decided not to do 121 midwifery but team care due to staff lifestyle balance – but the standard is that women meet 3 or fewer midwives during the entire pathway. Diane showed a video of an interview with South Asian couple. They could not understand this thing about being given toast after the birth. She said ‘Why am I being given warm bread? Is it some kind of ritual?’ Remembering the cultural aspects of communication and birth! Sustainability and where they are at: 240 births is the breakeven point for sustainability and in their first year they are on target to meet this point within three years. For equity however the HB team needs to be rolled out across Birmingham. Also, HB team in first year – none of the GP concerns have been realised!!! Strong cross professional leadership needed. Key here was GP leadership. If it fails this time around keep pushing: its time will come. Miss Margaret is an inspirational film that is well written following the story of a legendary Granny Midwife from Eutaw, Alabama. Margaret Charles Smith was born in 1906 and died in 2004 at the age of 98. Margaret was brought up in Alabama by a slave woman; she was the last of 10. She grew up working in the cotton fields until she decided she wasn’t going back to the fields again and she was going to get a different job! She started as a laundry woman, and then continued to do a midwifery course after showing natural skills delivering her husband’s cousin’s wife’s babies. She became a highly regarded midwife and delivering 3,500 babies at home (in a county population of just 10 000). She never lost a mother and never drove a car – despite travelling all over Alabama and sometimes further. There were times she delivered 4 babies a night, but she said she never gave up on a mother: using prayer and motherwit as her main tools, and patience and kind words as her main techniques. Then she was pushed into retirement as a law was passed that midwives, like her, were no longer allowed be midwives. So Margaret Smith wrote a book named ‘Listen to me Good’. This along with her phenomenal life story inspired the next generation midwives. I think this film was beautifully made, inspiring the watcher and emphasing the utter ‘amazingness’ of this woman’s extraordinary life despite the troubles she had being a black woman in America. It also made me think how tough things would have been for women then, how things have improved, and how things should continue to improve for women all over the world to have a comfortable birthing experience. It makes me think what an important vocation midwifery is. The DVD is called ‘Miss Margaret’ produced by Sage Femme. And many other online and off line book stores. Michel Odent – in the New Scientist!!!! Below is a pdf photo of the article in the 4th July issue. Well done NS!